2014 will see her turn 30 and even more persistent in her mission to make gourmet and gluten-free part of the same equation. Famously dismissing normal as boring, Aishwarya Nair, corporate food and beverage head for The Leela Group and Captain CP Krishnan Naira��s granddaughter, wants to turn our recent obsession for quinoa into something delicious and accessible with brand Amai. Japanese for a�?sweeta��, Amai, launched in Mumbai in September, will be available in Chennai, Bangalore and Delhi this year. It features cakes, crisps and protein bars made from the super grain and other gluten-free alternatives, and is an extension of her personal diet.a�?I want to pioneer the movement of being conscious of what you eat,a�? she says, speaking from London, where she brought in the new year with her Cambridge school friends. Amai is macrobiotic a�?in principlea�? with locally grown figs and as much seasonal produce as possible. Aishwarya has been on this health drive for close to 18 months now, after battling weight issues and self-admitted binge-eating and dieting. Discovering a sensitivity toA�certain food groups according to her blood type has given her direction, she says, adding, a�?Ia��ve been on the roller coaster and this year, I am trying to go vegan. I just want to be fit enough to do a marathon like my older sister, Amruda. She is a huge influence and proof that fitness makes you more productive and focussed. Obviously, I cana��t go overboard with it as I am also a gourmet!a�? Personally involved with the groupa��s premium international restaurants, like Megu and Le Cirque, the wine connoisseur hopes to introduce intensive training sessions for F&B assistants in particular, given their job profile. She is working on her team being more conversant with the nuances of wine. A lot of Indians are drinking wine these days, she admits, but observes that a huge component is missing. a�?It is a myth that our food does not go well with wine. Balancing the spices and tannins is something many are yet to be adept at. This is possibly because of accessibility; you either get the low end or high end wines, while the mid segment is missing in our country,a�? she shares. varieties. The list, a move to address the challenges faced by the debt-laden luxury hotel chain, will help with inventory and quality control, she says. It saw them short-listing 2,000 wines to 500 and then 300. That it includes eclectic Champagnes is a given; after all, in early 2013, Aishwarya was awarded the prestigious Diplome da��Honneur by the Corporation des Vignerons de Cham-pagne and the Comite Interprofessionel du Vin de Champagne (CIVC). 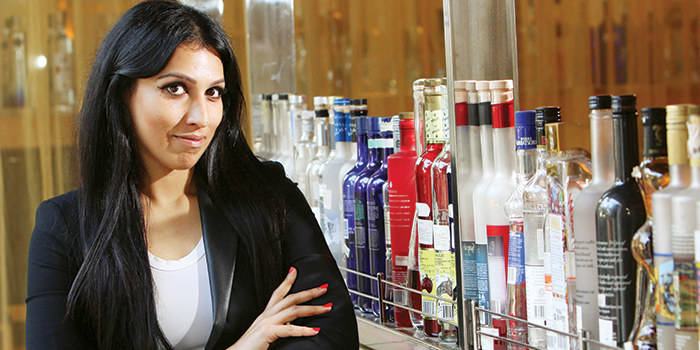 She is the first Indian woman to win the award, which is in recognition of the Champagne list she curated for The Library at Leela Palace in New Delhi. She likes her bubbly a�?beautifully robusta�? and graciously shares her selections (see box). About wines in general, Aishwarya observes that Indian preferences are slowly changing, but that varietals like Cabernet Sauvignon and, of course, Shiraz, continue to be popular. Aishwarya confides that she grew up as a rebel, a�?not always wearing or doinga�? what was expected of her. She is powered by food, fashion and cinema, prefers tart and chilli to sweet, almost always wears black, and enjoys travelling solo and to new placesa��Japan and Korea last year, and possibly Brazil in a few months.She makes it a point to visit local supermarkets wherever she goes. Japan, with its culture, minimalism and balance, was like a�?coming full circlea�? and it was inevitable that the design and philosophy would influence the guilt-free Amai. And then there is Dolce, a brand of sinful desserts presented the authentic way, that she launched on returning from her culinary arts management course in New York.Aware of social media as a revenue creator, she is active on Twitter and Instagram, and blogs on fashion, but reserves Facebook for a close circle of friends to deter a�?faux followers.a�? Amruda, 31, favouring numbers, extreme sports and animal activism, admits they are a�?at the opposite ends of the pole.a�? But the sisters make time for bonding surfing holidays. Family dinners are a�?a bit distorteda�? thanks to everyonea��s changing schedule but holidaying with the parents and brother, Aushim, is a must. As for their iconic grandfather, Captain Nair, Aishwarya says he is a a�?pillar of strengtha�?when it comes to both work and personal issues. a�?Resilience and dedication to the craft is what I have learned from my father and grandfather. Work came before everything else, and while I resented that as a child, I am grateful now for what they created,a�? she allows, concluding, a�?Something else they taught me was to think big. Ia��m very blunt and call a spade a spade. I know we are in debt, but we are a luxury company, and what matters most is vision.a�? Featuring quinoa and oats, Amai has no refined sugar and no preservatives and, says Aishwarya, is made for someone who works out a lot. Her favourite is miso toast. a�?You can have a handful of these as an alternative 4 pm snack. Ita��s like having chips,a�? she points out. The no-flour or sugar birthday or celebration cake with sweet dates, cocoa nibs and almond flour is already popular in Mumbai. a�?I try to be as hands on as possible and am involved in everything, from recipe development to packaging and marketing. In fact, the chef is a woman, the marketing person is a woman and Ia��m hoping we can make it an all-woman brand,a�? she chuckles. 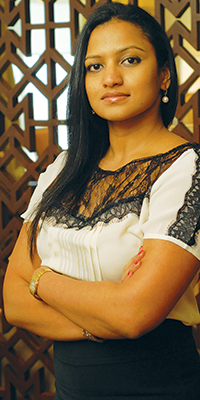 Amruda Nair, the corporate asset management head for The Leela Group, calls herself the a�?less creativea�? of the two, but is the person who studies the feasibility of new projects. Big on kite surfing, she initiated a metawellness programme with Aishwarya in 2011, that clubs medical expertise with Leelaa��s infrastructure and luxury, making it easier for people to address lifestyle ailments on holiday. a�?It is available in our Goa and Kovalam properties, and encourages participants to exercise with their kids. That way, wellness becomes a lifetime activity that extends beyond the holiday,a�? says Amruda, whose personal interest in fitness and extreme sports will see several developments with the hotel group this year. A firm believer of never fixing something till it is broken (gadgets, that is), she is waiting for a good reason to move on from the iPhone 4S. A fan of Belgian white beers, she is also obsessed about coffee and is hoping her father will succeed in bringing the Indonesian Kopi Luwak to the country. From her famous grandfather, she has learned to take risks, and from her father, attention to detail.